Just a hundred miles from New York City, the Catskills Mountains were a destination for wealthy New Yorkers as far back as the 1800's. Later -- mid 20th century--the area had a heyday with summer resorts that featured live comedy and entertainment-- if you've seen the original movie Dirty Dancing (set in 1963), you get the idea. Though those decades have faded to nostalgia now, families still head to Catskills resorts. 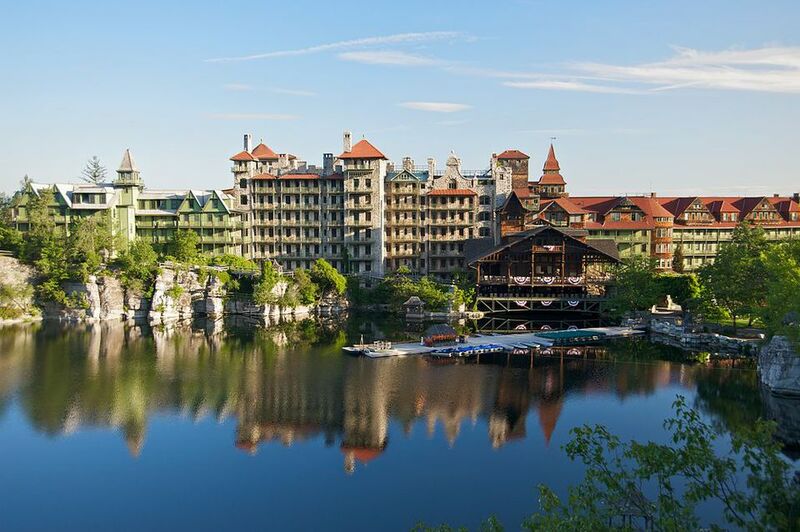 Picture a Victorian castle perched on cliffs by a mountain lake-- a National Historic Landmark, no less, with 1200 acres, 85 miles of hiking trails, lots of outdoors activities year-round; and only 90 miles from NYC. Kids Club runs during summer and occasional weekend throughout the year; theme programs include Haunted Happenings at Halloween. New Paltz, NY. 500-acre Rocking Horse Ranch offers numerous activities all included in your price (meals, too.) Winter snow tubing and skiing, ice skating, sleigh rides; indoor pool with fountains and geyser; horseback riding; summer water skiing, fishing, tennis, volleyball archery range, paddle boats, kids' program; lots more. Hudson Valley, near New Paltz, NY. Four-season resort; 400 acres; indoor & outdoor pools, tennis, basketball, miniature golf; nearby horseback riding and boating, hiking, mountain biking, snow tubing, cross-country skiing, outdoor ice skating, Kidz Klub. Shawangunk Mountains area, 20 minutes from New Paltz. Check visitors' comments about the condition of this resort. Kutshers is one of the old hotels that's still remaining, open since the year 1907. Kids programs for several age groups are offered; ice rink in winter is a feature. Check visitors comments about the condition of this hotel. Villa Roma has programs for tots, kids, preteens, and teens during peak periods; "tot lot", kiddie pool, arts & crafts, daily activities, barbecues, hayrides... Golf, outdoor pool, year-round indoor pool, tennis and other sports, spa, bumper boats. Winter skiing, snowmobiling, sleighrides. Check for family specials at holidays. Be sure to read recent visitors comments at a site like TripAdvisor. Built at the turn of the century in Victorian style); "relaxed comfort" on Main Street in the historic village of Fleischmanns; family-friendly and pets welcome. Belleayre Mountain is just two miles away; in winter, look for packages that include ski tix. New Paltz, nearby Shawangunk and the surrounding area are popular spots for summer vacations. The Ulster County website has a good list of Lodges, Inns, Resort Hotels, and more. See lists of accommodation (resorts, inns, etc.) at the Sullivan County section, Green County, and Delaware County. Click on Photo Galleries for old hotels, family photos, etc.